Is MSG Safe for Everyone? Ketchup is probably my favorite condiment. I use it in cooking (e.g., meatloaf, my famous baked beans, let’s not forget sloppy Joe’s), on sandwiches (a must-have on grilled hot dogs and hamburgers) and in a variety of other ways (I should confess I can’t eat French fries without lots of it, but you probably could’ve guessed that at this point!). When my love of ketchup first began, little did I know that it was likely in part because of my love of tomatoes, which provides an undeniable umami taste. Without ever having realized it, I now recognize that my devotion to ketchup is relevant to this blog because it imparts the same umami taste as does MSG. Without using fancy culinary terms, let’s slice right to the core of why monosodium glutamate makes so many foods taste so darned good!… umami! (Ding! Ding! Ding!) Umami is now said to have become a 21st century culinary juggernaut. Who knew? MSG imparts the umami flavor (or boosts the savory flavor) of an array of foods by contributing this important taste. (Umami, which was identified over a century ago, is the fifth taste that goes along with the other recognized basic tastes – salty, sour, sweet and bitter). In addition to the savory flavor enhancement properties that MSG brings to foods, the sodium content of a recipe can be reduced by using MSG in place of a proportion of salt. Similarly, total sodium content can be reduced by almost half without diminishing the taste. Why? MSG contains one third of the amount of sodium as table salt. Now keep in mind one essential fact that I alluded to above: the umami flavor imparted by MSG is considered “savory,” therefore it only harmonizes well with other ingredients in salty and sour types of dishes. Likewise, MSG contributes little or nothing to sweet or bitter foods. When I talk about savory, think red meat, poultry, seafood, vegetables, soups, casseroles, egg dishes, gravies and sauces. 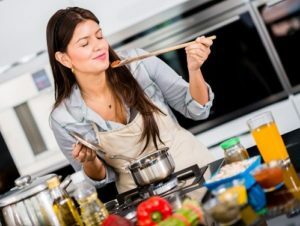 For some specific recipes and ideas for cooking with MSG, check out our Savory Cuisine Corner where we have numerous recipes that use MSG as an ingredient. You may also want to read more about using MSG in cooking. In closing, I’d like to challenge you to put MSG on your shopping list and give it a try the next time you prepare a soup, meat or vegetable casserole or any savory recipe – but don’t forget to cut back on the table salt! MSG can be found in the condiments or spice section at the grocery store (Ac’cent® is a common name brand) so it is simple to find. Approximately one-half teaspoon of MSG is an effective amount to enhance the flavor of a pound of meat or four-to-six servings of vegetables, casseroles or soup. As with all flavorings and spices, taste levels may vary from individual to individual. Use MSG in the same types of recipes you might use salt or pepper. Where does MSG work best in recipes and in cooking? Think meats, poultry, seafood, vegetables, soups, casseroles, egg dishes, gravies and sauces. MSG will not enhance or complement the flavor of sweet foods such as cakes, pastries, custards or puddings. MSG is not a meat tenderizer. Instead it functions as an umami taste enhancer giving an extra flavor boost to the meat being tenderized. MSG cannot cover up bad tasting food or allow a cook to substitute low quality ingredients for higher quality ingredients. It only enhances the savory flavors that are already present; it doesn’t add new ones or mask “off” flavors. Don’t overdo it. Overuse of MSG, just like with other seasonings, can result in an undesirable taste (e.g., too much salt, chili powder, garlic, curry). Enjoy! And we encourage you to share your yummy recipes with us in the comment section on MSGdish, or by email via info@msgdish.com. This article first appeared on the MSGdish blog. It is reprinted with the permission of MSGdish and Kaye Taylor, the author and consulting nutritionist. Why Do We Need Flavor Enhancers, Such as MSG, in Food? Since its discovery in 1908, monosodium glutamate (MSG) has been used safely and effectively to enhance the taste of foods. The extensive scientific research on glutamate, umami and monosodium glutamate has been reviewed by scientists and regulators worldwide. The U.S. Food & Drug Administration and regulatory agencies around the world have concluded that monosodium glutamate (MSG) is safe for everyone. Glutamate seasoning is the simplest, purest way to add umami to food.